Hours after an ABC News report on Thursday that Michael Cohen had spent hours talking to special counsel Robert Mueller’s team about Trump’s Russia ties, the man himself decided to weigh in on the topic. The rollout may have been a little bungled. 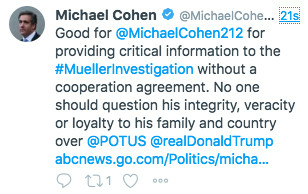 But it’s now clear Cohen’s camp is very happy indeed with the new ABC story on Cohen being questioned by Mueller. This is a theme Cohen’s PR team has been attempting to get picked up by the news media for quite some time. Whether it’s actually true remains … unproven. Ever since the FBI raided Cohen’s residence and office in April, a drama over whether he’ll “flip” on President Trump has unfolded, much of it in public via leaks from people close to him. In early July, Cohen decided to make even more waves by hinting on the record to ABC’s George Stephanopoulos that he was considering flipping — he said his main “loyalty” was to his family, not Trump. Stephanopoulos also asked Cohen a curiously specific question — whether Trump knew about the infamous Trump Tower meeting beforehand. (This is, of course, Donald Trump Jr.’s meeting with a Russian lawyer to get dirt on Hillary Clinton in June 2016. The president has denied knowing anything about it at the time.) Cohen conspicuously declined to answer. Soon afterward, Cohen hired Davis, a Clinton ally and PR bulldog. Then the news media began to report more tantalizing hints that Cohen had crucial Trump-Russia information, leading to a July 26 CNN report that, per “sources,” Cohen claimed that Trump himself knew about his son Don Jr.’s infamous meeting with a Russian lawyer in advance. But shortly after Cohen pleaded guilty to tax, bank fraud, and campaign finance charges in New York last month, his team changed their tune. Davis began to tell reporters that no, he wasn’t sure if Cohen had bombshell Trump-Russia information after all, and that yes, he was an anonymous source for many of the stories that made that claim. Now, it seems, we’re doing this again. An ABC reporting team including, again, Stephanopoulos cited “sources” in describing Cohen’s recent talks with Mueller. Hours later, this Twitter mix-up has made clear this is exactly the story Cohen and Davis want out there. Whether Cohen is anywhere near as important to Mueller’s probe as his team wants us to think remains to be seen. But recent experience suggests a few grains of salt are in order.